Heat, Lakers & Quarterbacks, Oh My! Can anyone in the Eastern Conference knock off the almighty Miami Heat? Sammy: Only one team can. And only one team will. And that is the red-hot New York Carmelos! 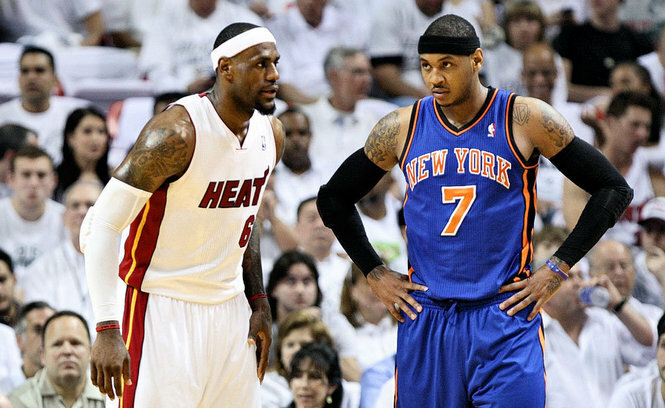 Tye: Carmelo’s playing great but he’s not LeBron. Melo can score but he can’t compare to LeBron on the defensive end. And JR Smith is nowhere near D-Wade’s level. The Knicks are like a poor man’s Heat. LISound: The Heat will not be stopped, especially by a team in the Eastern Conference. LeBron has developed a killer instinct, and will stop at nothing to embarrass all of his critics from the last 10 years. Wade has been playing extremely well this season, but it has been overshadowed by LeBron’s dominance. Sammy: No question LeBron is not a real human being. But the power inside game of the Knicks — especially the presence of Tyson Chandler — can (and will) cause problems for the driving game of James and Wade. Plus, it could come down to who makes more threes. Tye: There’s no way in hell I bet against the Heat. LeBron had demonstrated he can do whatever is needed to win this year. The Knicks won 12 in a row. Miami more than doubled that with 27. Long Island Sound: It will be hard for be Knicks’ inside game to be a problem when they get 5-10 shots a game. I don’t see a heat Eastern Conference playoff series going past six games. Sammy: I’m more cognizant of the inside PRESENCE of Chandler on the defensive end. If he stays healthy he is a force, he will help with all the driving Lebron and Wade do. Tye: He’ll help but it’s not going to be enough. If he tries to compete with LeBron and Wade driving, he’s going to pick up fouls early and be a quick out. Long Island Sound: Gents, these are details that need to go right in a best-of-seven series. They won’t. Heat are going to roll the East. What is next for Kobe and the Lakers? LISound: Bad time for all sports fans to lose such a star before the playoffs, but a positive of this would be for Dwight Howard to thrive and pave a future in LA. Sammy: This is simultaneously a time for Laker fans to mourn the loss of a superstar and embrace a new one. 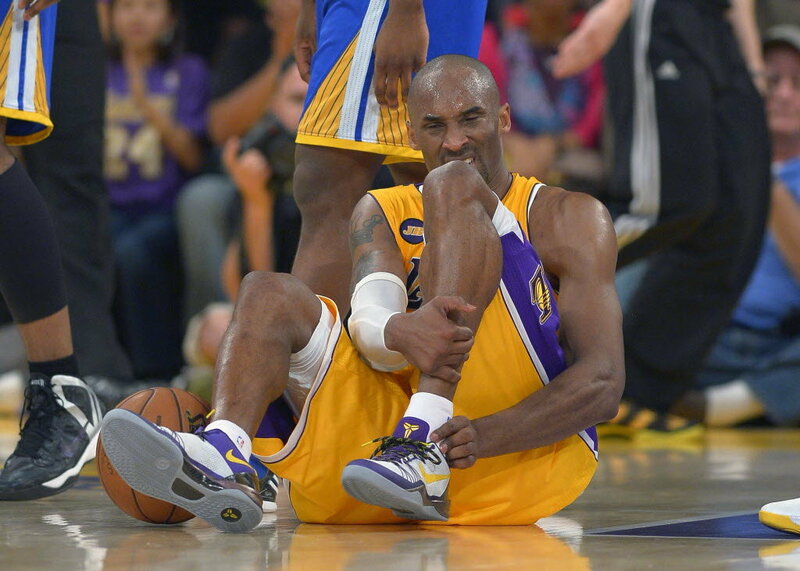 Kobe’s injury, as a Laker fan, is incredibly tough to stomach. But can the inside-out approach of a Dwight-led Lakers work? Tye: I personally like the idea of amnestying Kobe next year. The Lakers save big money and possibly improve the team. Kobe still gets paid and has the year off to recover, and then can come back on a cheap contract with a good roster to go for six. LISound: No way Kobe will allow the Lakers to do that. What is best for the Lakers now is to start their identity with Dwight Howard. It’s needed for success now and in the future. Sammy: And if Dwight bombs and the Spurs sweep the Lakers? Is his heart really into being “the man” in LA? Only the off-season will tell, but Kobe could conceivably be back by next season’s start. Is Dwight risking another hellish season? It starts (and ends) with Dwight, or else this is a team starting over. Tye: If Kobe comes back next season then yes, using the amnesty won’t work. I think the team will be fine going through Dwight though. Diva Dwight gets his touches and the Lakers can still get good assets by trading Pau Gasol if they need more depth. LISound: This entire Laker team looked good on NBA2K, but in reality their styles, especially with this coach, do not mesh well. As they near towards a first-round show down with the Spurs, not getting swept would be a positive at this point. Sammy: The Lakers need to find a way to get some good young talent. They never do poorly enough to get a good draft pick and they rely heavily on free agency. It’s eventually going to stop being a good system. Tye: I wouldn’t be surprised if they traded Pau to get a shooting guard and big man. The Lakers are one of the favorite free agent destinations and they’ll always be able sign players. Would you draft a quarterback in the first round this year? Sammy: This year, there is only one quarterback who I’d draft in the first round: Geno Smith. But only late in the first. Similar to how the Packers handled Mr. Rodgers. Tye: Geno is worth a first rounder but if it was my team I wouldn’t want them to use it on him. There’s not a ton of separation between QB prospects and I’d be just as happy with a Matt Barkley or EJ Manuel along with using my first rounder for a different team need. LISound: All the teams that need a QB are in the portion of the draft where it could be too much of a reach to pull the trigger, but if able to trade back; Geno Smith is well worth rolling the dice on. I view him very similar to Donovan McNabb. QB capable of running, but wants to throw. Sammy: Are we sleeping on Matt Barkley? 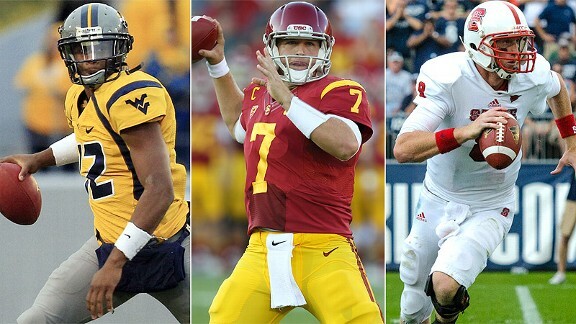 As a Raiders fan, I know to be wary of USC QBs (See Palmer, Carson and Leinart, Matt). But Barkley was a solid prospect before his injury and performance this year. Tye: He was the unanimous number 1 pick before this year but he’s been pushed down to the second round by most teams. I watched him since I was a freshman at SC until now and I think that the team who gets him is getting a franchise QB for a steal. LISound: Jake Locker was a steal too, right? Barkley needs to be drafted into a West Coast system and time to develop. USC QBs come in from college where they had a plethora of talent at that level, and are now looked to succeed throwing to a mix of talent at skill positions and less than 10 bubble screens a game. I’m not sleeping on Barkley, just napping until the third round. Tye: Locker went eighth overall while Barkley is looking at the second round. A much safer pick for a team to take a risk on. I wouldn’t use my first rounder on him but I think a team in need of a quarterback that uses their first rounder for another need then drafts Barkley in the second could do much worse.